Andrew Ross Sorkin: "Whether it was or not, the case always felt political. The Justice Department’s attempt to block AT&T’s acquisition of Time Warner never made sense on the merits of the case... The calculus for companies considering mergers — or any decision — shouldn’t be whether they think a president will seek to block or approve it on a whim." FIRST LOOK -- Who Is Behind Trump’s Links to Arab Princes? A Billionaire Friend -- by David Kirkpatrick: “Confusion about your friend Donald Trump is VERY high,” Ambassador Yousef al-Otaiba of the United Arab Emirates emailed back when [Tom] Barrack tried to introduce the candidate... Mr. Trump’s image, the ambassador warned, “has many people extremely worried.”Mr. Barrack’s email correspondence with Ambassador Otaiba... was provided to The New York Times by an anonymous group critical of Emirati foreign policy, and it illustrates the formative role Mr. Barrack played as a matchmaker between Mr. Trump and the Persian Gulf princes." ROAD TO PEACE -- Kushner to visit Israel, Egypt and Saudi Arabia for peace plan talks -- by Barak Ravid: ”Jared Kushner and special envoy Jason Greenblatt, will travel to Israel, Egypt and Saudi Arabia next week to discuss the next stages of the peace effort and the crisis in Gaza Kushner and Greenblatt want to discuss lingering questions they have as they finish drafting the peace plan, including the optimal time for launching it." Trump admin official: "The peace team didn’t ask for a meeting [with the Palestinians] for this trip. The Palestinian leadership will know Kushner and Greenblatt are in the region and if the Palestinian leadership wants to meet, Kushner and Greenblatt are ready to meet." AT THE UN -- Palestinians seek UN vote blaming Israel; US wants changes -- by Edith Lederer: "The Palestinians... are hoping an emergency meeting of the U.N. General Assembly... will adopt a resolution deploring what it calls Israel's "excessive use of force," particularly in Gaza... Arab and Islamic nations decided to go to the 193-member assembly, where there are no vetoes, following the U.S. veto of virtually the same resolution in the Security Council on June 1." 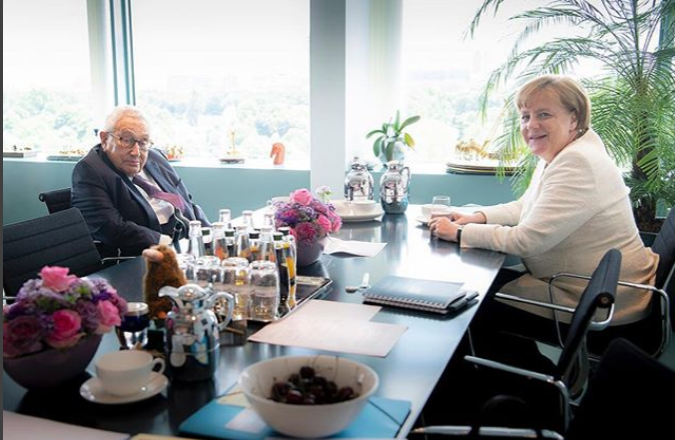 PIC OF THE DAY -- German Chancellor Angela Merkel met with Henry Kissinger in Berlin yesterday. HAPPENING TODAY -- Attorney General Jeff Sessions is set to keynote the Orthodox Union Advocacy Center annual mission to Washington, DC. Sessions is expected to focus on religious liberty and security for religious schools and synagogues, according to the organizers. Senators Chuck Schumer (D-NY), Ben Cardin (D-MD), Tom Cotton (R-AK) and Ted Cruz (R-TX) will speak at the OU's luncheon in the Hart Senate Office Building. STATE SIDE -- The New York State Senate passed a measure yesterday requiring the State Education Department to review specific school districts’ teaching guidelines and issue regulations necessary to ensure school districts are providing history lessons about the Holocaust. The State Education Commissioner would also be required to deliver a report on findings to the Legislature and the Governor so that all stakeholders can better understand statewide school districts’ aptitude for teaching this type of curriculum.